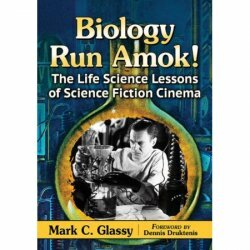 From Scary Monsters magazine's very own Scary scientist and columnist Mark C. Glassy, Ph.D., comes this excellent and entertaining book on The Life Science Lessons of Science Fiction Cinema! Science fiction movie audiences may sometimes wonder how fictitious the science in a film really is. Yet for many--call them the "Jurassic Park generation"--film and popular media can present a seemingly plausible melding of science and fiction that forms a distorted understanding of scientific facts and concepts. Recognizing that film is both the dominant entertainment medium and an effective tool for teaching, this book separates biological reality from fantasy in dozens of science fiction films, including The Island of Lost Souls (1933), The Incredible Shrinking Man (1957), War of the Worlds (1953), A Clockwork Orange (1971), Scanners (1980), The Serpent and the Rainbow (1987) and Outbreak (1995). Biology Run Amok! 164 pages. McFarland (April 2018). Ordering and Shipping Note: This book is brand new and shipped to us directly from the publisher. It qualifies for economy Media Mail shipping in the U.S. However, if your order will also include items that do not qualify for Media Mail (anything other than books, DVDs and VHS. Magazines do not qualify because of the ads), you will need to do separate orders or choose a different shipping option. Choosing Media Mail when items do not qualify will likely delay your order and require additional postage. Our shopping cart calculates postage based on total weight of all items. On certain items we can save our customers postage by using flat-rate envelopes or boxes. In those instances, or if there are significant miscalculations by the shopping cart, we will give a partial shipping refund.